Description - The size of this noxious odoured creature is similar to that of a housecat. 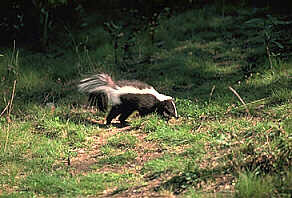 The strped skunk has a small, black head with a white stripe between the eyes and two broad white stripes which meet at the shoulders of its black back. The tail is black with a white tip or fringe. Distribution - The striped skunk prefers the desert, woodlands, grassy plains and suburbs. It occurs throughout the interior and southern tier of Canadian provinces and all of America. Biology - The unique characteristic of the skunk is its ability to spray a fetid, oily, yellowish musk 10-15 inches. This fluid in the eyes causes intense pain and a fleeting loss of vision. Ammonia or tomato juice are best to remove the odour. Tracks - The skunk leaves a distinct pattern which is easily identified. The smaller front feet are pigeon-toed and placed just ahead of the larger rear feet while in motion. This five-toed creature has long claws which are usually evident in the print.